Available at Barnes & Noble, Target and elsewhere in hardcover, NOOK Book, Kindle, etc. This book from the Modern Witchcraft series is essentially a reprint of Judy Ann Nock’s “The Provenance Press Guide to the Wiccan Year: A Year Round Guide to Spells, Rituals, and Holiday Celebrations,” published in 2007. There is a new introduction and minor word changes, but then, the wheel of the year and the night sky have changed little from ancient times, and the book does provides quality information. Each chapter focuses on a season that corresponds to a pagan holiday. Nock provides an introduction, an explanation of the sabbat, a description of the night sky for that period, the astrological influences and mythological references. 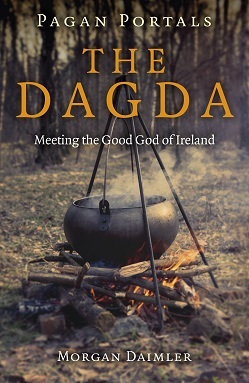 Searching for inspiration for an Imbolc ritual, that is the chapter I read most throughly. Noting that in arcane astrology, Imbolc fell under the sign of Aquarius, she connects the returning light of the sun and Brighid’s fire aspect, and the image of the water bearer with Brighid’s sacred wells. There are spells, rituals, crafts and other suggestions for celebrating each season. For Imbolc is a meditation delving into the healing waters of Brighid’s sacred well, which is symbolic of the depths of the womb from which we all come. There is an eclectic initiatory rite suitable for a coven, and a scrying ritual that can be done as a solitary. The crafts are Brighid’s cross, Brighid’s eye (also known as God’s eye) and the bride’s bed. The book begins with Samhain and moves through Mabon, providing a guide to celebrate every turn of the wheel. Reading it, it’s easy to see how the 360 degrees of a circle overlay easily on a 365-day calendar. While the majority of the book focuses on solar influences, there is a chapter on the estates with a lunar calendar, astrology and meditations with the moon goddess. The appendix has correspondences and a glossary of terms. This book would be helpful to anyone wanting to learn about the Wheel of the Year, and serves as a reference to return to again and again. Julie Dollman, also known as Spirit Heart, is a graduate of the Four Winds Society, which trains others in the skills of Shamanism and Energy Healing. She is also the founder of one of the first ever high street Shamanic clinics, and the author of the book Living Shamanism, which sets about demystifying the role of the modern Shaman. Julie gave up some of her time to answer a few questions for me. Mabh: What inspired the transition from Crime Analyst to Shamanic healer? Julie: Initially, it was the work with The Four Winds Society… I became reconnected wholeheartedly to Great Spirit and the Divine Consciousness in the form of shamanism… and this changed me completely. Nearing the end of our training (three years), my husband and I underwent an initiation with two Qero Priests who had travelled over to Ireland. The time spent with them, where none of us could understand the other due to language barriers, other than some sparse translation from the guide who had travelled with them; something magical happened to change everything that I had become used to, especially in the way I had been living my life. From that moment on, I distinctly knew that I was in the wrong job role. I had returned to work in late November 2005; attempting to pattern crime trends and profile the offenders and I immediately felt at odds with society; confusion reigned as all that I could see were victims of life… this applied to both those who were the victims of crime and those who had carried them out. From that point onwards, my heart and soul moved in mysterious ways and by the end of March 2006, I left my job and stepped fully into service as a shaman healer, a western medicine woman. MS: Can you tell us a bit about your experience learning with The Four Winds Society? What were the biggest challenges, and the most rewarding moments? JD: The time spent with the Four Winds was literally life-changing. Every time we turned up for our week long course we both felt excitement and anticipation deep within our stomachs. (My husband and I both completed the training at the same time). The experience of sitting in the presence of Alberto Villoldo was like being spirited away to a place between the veils. The personal work was incredibly challenging. It never failed to unearth that which needed healing and never failed to deliver the magic of core Peruvian shamanism. The challenges were always connected to the challenges between the self and the self… and came in many guises. Sometimes they arrived in the form of the person that you were paired up to work with, as your shadow aspects were often mirrored back to you. Sometimes they came in the form of how one’s energy body was in chaos as it calibrated itself into a new form, usually this was experienced after the course had finished and you were catapulted back to the material world! The rewards though were wonderful; as often as you were challenged, there was always the polarity offered in the form of gifts from Great Spirit. Moments like being fully present at fire ceremony alongside other course participants, all of us in communication with the Divine and the times spent in the presence of the Qero Elders, bringing with them the magic and mystery of the snow-capped mountains of Peru… to the times spent inbetween classes, laughing, singing, playing drums and relaxing with the other students, like-minded individuals who had travelled to Ireland from all over the world. MS: Your book, Living Shamanism, sets about de-mystifying Shamanic practice in our modern world; do you believe anyone can tap the potential within them to become a Shaman? JD: It isn’t purely about the potentiality of becoming a shaman that is wholly important. It is to tap into one’s own potential… full stop. As a western society we have become disconnected from having and experiencing faith, maybe in ourselves, others, The Divine and even the Planet. Anyone who has learned about connecting to faith will also know how to tap into their own potential; they go hand in hand. For some of us as human beings, we can be a somewhat fragmented being who, for whatever reason, seem to have forgotten that in order to be the best that we can possibly be, we need to harmonise the mind, the body and the spiritual. When we can do this, we have truly tapped into our potential. Shamanism, Druidism, Wicca and Christianity may be a few possible sources to rekindle the fire of our own potential once again. MS: One of the aspects of healing you perform is dealing with ancestral wounds. Can you tell us a bit about this? How do ancestral wounds manifest themselves? JD: Each and every one of us is a profusion of data… held in each cell, tissue and within our DNA… containing information of who we are, what we are and where we have come from. Being part of a genetic pool, the wounds, events and stories of our ancestors are held like an inactive computer file of data within our cells and DNA. This watery gene pool of information becomes part of our make-up, behaviours and often our belief systems. This manifests into the way we do things, our characteristics, even the type of job role we choose; most importantly, however, it can manifest as a hereditary affinity to experiencing an inherited physical or mental illness. Putting it simply, the legacies from our ancestors, both good and negative, can resurface in us. MS: What’s the most challenging healing you have ever been involved in, and what was the outcome? JD: There have been several challenges and some that have been presented where humanly you could see no hope for… that is if you subscribe to the fact of impossibility. However, as a medicine woman I hold firmly on to the belief that anything is possible… and I have witnessed some wonderful, transformational and joyous outcomes with many of my clients. I have seen cases of extreme sexual abuse, cancer and possession; I have even had women come to me desperately wanting to have a baby… each and every client arrives with a challenge. One of my happiest moments was when a lady arrived who had been in and out of psychiatric care throughout her life. She had endured long bouts of depression and anxiety… following around eight appointments, her psychiatrist discharged her as she had literally been healed… I am blessed and grateful for every man and woman who comes through my door and they have been some of my greatest teachers. MS: Your husband is also a Shaman; do you work together in your practices or do you each follow your own path? JD: My husband and I love to bring two sides of possibility into the healing arena. Often when we work together we each bring in the qualities of the masculine and feminine aspects required to balance the whole. Paul is an expert tracker; he can track the route of a client’s problem and see the limiting stumbling block that is blocking the client’s potential. He also holds the shamanic name ‘TruthSayer’, allowing him to wade through any smokescreens. We often work together on family and couple healing sessions and in ceremony. He spends the rest of his time in the creative arena of wood-carving, where he produces beautiful tribal art in the form of healing and ceremonial staffs, talking sticks and altar pieces. He has a talent to transmute the qualities contained in a piece of wood and turn it into healing aids for his customers. MS: What kind of goods would we find in your Peruvian Shamanic Supplies Shop? And what’s the most in demand product at your store? JD: We founded Ayni Shamans Shop eight years ago while we were training, as we had found it incredibly hard to get hold of the Peruvian items needed for our courses, these included Textiles, Rattles, Agua De Florida Water and Palo Santo Wood Incense. We wanted to purchase the items from the Peruvian artists, never haggling down a price as a way of reciprocal Ayni. As more and more people have jumped onto the bandwagon of offering Peruvian shamanic supplies, this year we decided to grow and change the shop to become more authentic to whom we are both as shamans and purveyors of living energy. The Ayni Shamans Store still stocks some of the Peruvian favourites such as Agua De Florida water, Palo Santo and we have a direct link with Peru offering bags, Chumpi stones and other artistry items. For us now, we bring our own essence to it… offering Sacred Ceremonial Incenses, Shamanic Healing Oils, Ceremonial Tools and TruthSayers and Wood . MS: Do all the Shamanic practices you perform have their roots in South America? How well do these translate into our British or European society? Do you think Shamanic practices are relevant anywhere in the world and why? JD: When I first started healing, I used core Peruvian shamanism as my healing modality. Now many of the processes I use include a mixture of South American as well as some that have been gifted to me from my ethereal teachers. The processes I offer have been tailored and defined to deal with the many requirements of my clients’ healing needs. They translate extremely well, as I am a medicine woman living in western society, and know full well the pitfalls that befall us as a society. I also understand that thorough healing is achieved on four levels… the psychological, the energetic, the soul and the literal. My healing processes always start and end by consulting with the client and there is often homework given, in order that the experience in the healing room is brought into both the literal and psychological areas of a client’s life, the place of mind and body. Shamanic healing practises are relevant as there is a need for a healer who can safely travel to any level or dimension in order to attain healing for a client. Clients’ wounds can reside anywhere from the underworld, soul and power loss, the ancestral gene pool and also their past lives. We also understand that heavy energy, manifesting in the form of behaviours and addictions, may be affiliated to energy that has formed almost its own entity; and of course, there are entities out there that will latch onto a living soul in order to try and experience life once more. A skilled shaman will know how to heal, clear and cleanse all of these facets. MS: You were one of the first people to set up a Shamanic healing clinic on the high street. Can you tell us a bit about how this works? Can people literally walk in off the street to discuss their needs? JD: When I left work in 2006, I had an inner voice that urged me to bring shamanism out of the closet and to be accessible for all. So we found appropriate premises and boldly offered shamanic healing as a modality that we felt was eminently effective within our modern society. People came… they started by peering in through the window and eventually their curiosity led them through the door. It was very accessible as we had a big sofa in the reception area and people could come in, sit down and ask questions or book healing appointments, whilst also exploring spirituality and shamanism. Today, as we live fast paced lives, disconnection to source and the way people establish their lives often after enduring many different negative experiences… a shaman offering them the sense of hope and shining a light for them was inspiring. Our clinic window also displayed the exact processes that we offered and the type of energy we dealt with; this resulted in people coming, experiencing the healing and leaving feeling lighter and brighter. MS: When it first started, how was the clinic accepted by the other high street retailers? What sort of interactions did you have? MS: You’ve had some really positive feedback regarding your book and the way it has helped people find their path; what’s the most inspiring feedback you’ve had? “I highly recommend this book. I learned so much to help me in my journey to become a shaman practitioner”. MS: And what’s next? Any more books planned? Or are you planning to expand the clinic at all? 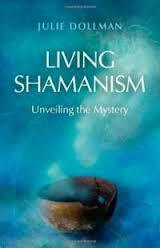 JD: I am writing a second book which continues on from Living Shamanism: Unveiling the Mystery. It delves much more deeply into some of the pitfalls of humanity on a grander scale, discussing subjects such as our human potential and the alchemy of living energy. Throughout the book I am establishing just why so many people are on the path of ‘constant healing’. The clinic is established and very busy, we do not wish for any more expansion as we have other facets to us, including the shop, writing and eventually the desire to take ourselves on the road across the world. MS: As a Shaman and a healer, how do you continually stretch your abilities; where do you turn for your own spiritual progression? JD: Ah yes, sometimes my abilities become stretched within the healing environment and I always ask for help from either my ethereal teachers or I seek counsel from my husband. When you are in the realms of healing living energy you are faced with a plethora of different energies in many forms… my husband is the ‘face of reason’, an excellent seer and also my sentinel. As far as my own spiritual progression is concerned that is always a matter for the aether; whether it comes in the form of visions, teachings and experiences, being in nature, or in the simpler form of the right book arriving at the right time. Most of all though, I must say that to progress we must ensure that we are always aware and open to the messages and opportunities that we are faced with; by keeping our feet firmly in the present, each and every day will teach us something about ourselves and our earth-walk in general. MS: And who has been the most influential person on this journey? JD: It would be hard to mention just one person as there have been several people along the way who have influenced my spiritual development in some profound ways. From my teachers Alberto Villoldo and Linda Fitch of the Four Winds, to several Qero Priests and even some teachers from the higher dimensions. But truly and constantly, it has been my family. My daughters and their incredible insights have often left me speechless; my husband and the information that he shares from his downloads have been great sources of wisdom and joy. I must mention a couple of authors who have literally opened up innate possibilities of transcendence on my current journey and they are: Jessie Ayani, author of The Codes of the Lineage of the Light and Brotherhood of the Magi; and Rhonda Byrne, author of The Secret and The Magic. These two ladies have filled in various gaps in my development and opened up my mind to the many incredible lessons of possibility. Julie’s book, Living Shamanism is published through Moon and available through Amazon and all good book retailers. You can visit her Shamanic store online at aynishamansshop.co.uk and her healing website at www.aynishamanichealing.eu .